Earlier this month, I was lucky enough to join some of the Indiewalls team in California for BD West. As Head Curator for Indiewalls, I’m typically based at our New York City headquarters — so it’s not every day that I find myself in sunny Los Angeles. I decided to make the most of it by connecting with the Indiewalls local Artist Community and setting up 5 artist studio tours. In the spirit of Women’s History Month, I chose an all-female roster of artists who create diverse work that I find particularly inspiring. Joined by some interior designer clients and friends from EDG, CMCA, Arcsine, MD Architects, Google Real Estate and Workplace Services, Prospera Hotels, Transition State, and Gulla Jonsdottir, I set out for two days of studio tours, artist meet and greets, and, fortunately, homemade scones. For our first stop in LA, Nicole Landau was generous enough to invite the group into her home studio to view her stunning and sensual digital photo collages. Nicole's rhythmic prints, made by intricately remixing photos of doorknobs, are always custom created, so no two pieces or prints are the same. I’ve worked with Nicole on several projects (but don’t take my word for it), so it was a real treat to see her in her element. Plus, she sent us on our way with doggy bags of handmade coconut and raspberry scones. Doesn’t get much better than that. Side by shots of two XL works by Nicole, face mounted to acrylic and hanging on her studio walls. At her desk, Nicole showed the group how she custom collages and modifies each piece to fit the scale and personality for every individual client. While Shana Mabari usually splits her time between Venice Beach and Ibiza, she brought some of her kinetic sculptures to Nicole’s studio for a special viewing. Shana explores the dynamics of visual perception by creating iridescent, swiveling acrylic sculptures that playfully bounce light throughout the room. Aptly inspired by the Light and Space Movement local to California in the 60’s, Shana’s light-catching sculptures create immersive environments that allow viewers to rediscover and re-experience otherwise uniform spaces at each viewing. A side by side view of 3 of Shana’s sculptures, which swivel on acrylic bases and reflect light in the space. Each face is made from a different color of mirrored acrylic, so the sculptures appear differently based on their environment’s light source. LEFT: An action shot of Shana walking us through her process. RIGHT: Each sculpture is meticulously inscribed with the artist’s signature. Annie Terrazzo is a team favorite, whose mixed media artwork has been placed in several Indiewalls properties, both big and small. Annie creates dynamic base collages made of newspaper clippings, found objects, and magazines and then paints glamorous, fashion-inspired portraits overtop. Stemming from an unorthodox upbringing and complicated familial relationships, Annie’s use of “trash portraiture” is a sensual and expressive exploration of gender roles, femininity, and sexuality, each piece no doubt helping the artist to deconstruct her own constantly evolving identity. LEFT: Annie, left, walks us through a work in progress that will eventually be several feet in size, spanning several panels; RIGHT: An inspiration board hangs alongside Annie’s artwork, where she pins ads and paper clippings. After the studio visit, we were lucky enough to get a tour of the gorgeous Figueroa Hotel, where Annie’s piece The Passing of Time hangs over the Junior Suite beds. 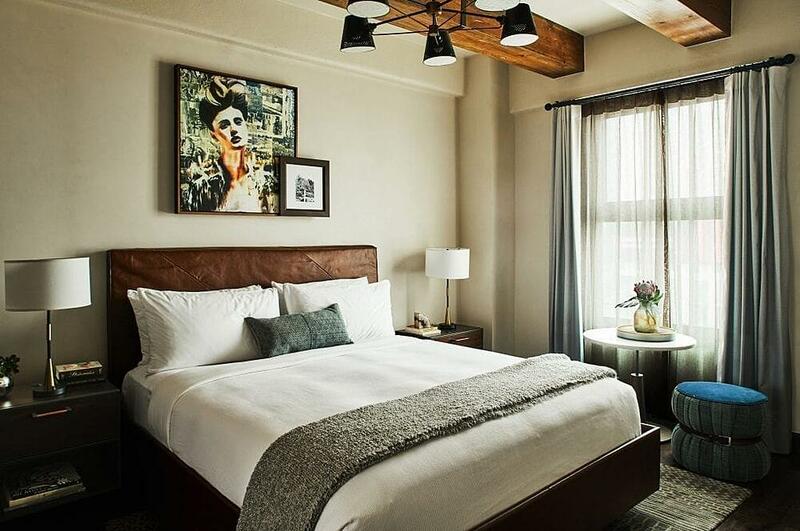 The Figueroa Hotel in DTLA features a portrait by Annie printed on gallery wrapped canvas at 33”W x 35”H, flanked by “San Gabriel” by LA local artist Mary Rasmussen. Sabrina Piersol is a painter and printmaker based in the Boyle Heights area, whose dreamy larger than life paintings left the whole group stunned. Sabrina takes a unique movement-centric approach to her process, allowing her emotional, improvised movements to dictate the final presentation of her paintings. Sabrina believes heavily in the idea of finding through doing and tries to keep as busy as possible experimenting in her live-work studio, which also doubles as a DIY music venue. To up the womanpower, Sabrina takes after her mother, who was also a painter. 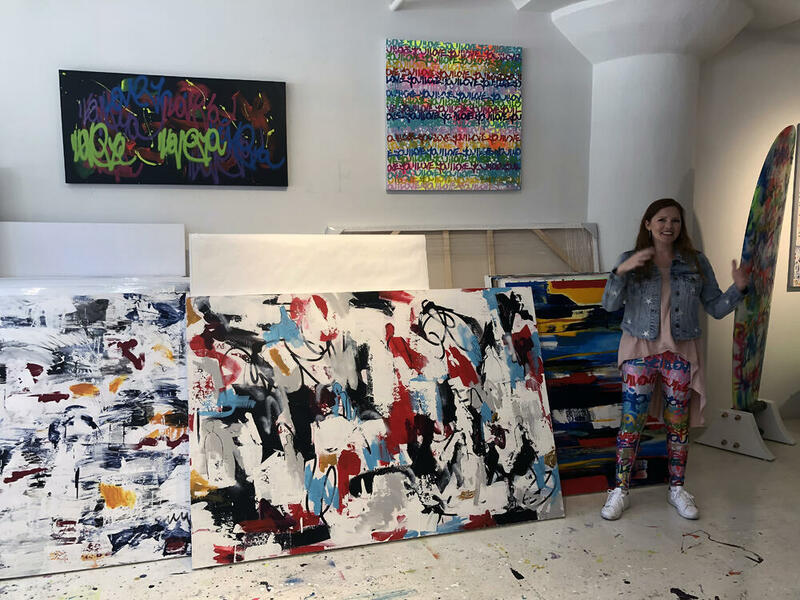 LEFT: Sabrina’s latest paintings are as large as 48”W x 72”H, and are made with layered flashe, oil paint, and oil sticks on gallery wrapped canvas; RIGHT: A detail shot of her piece New Pants. The lines of work/live space are blurred in Sabrina’s studio, which also moonlights as a music venue. 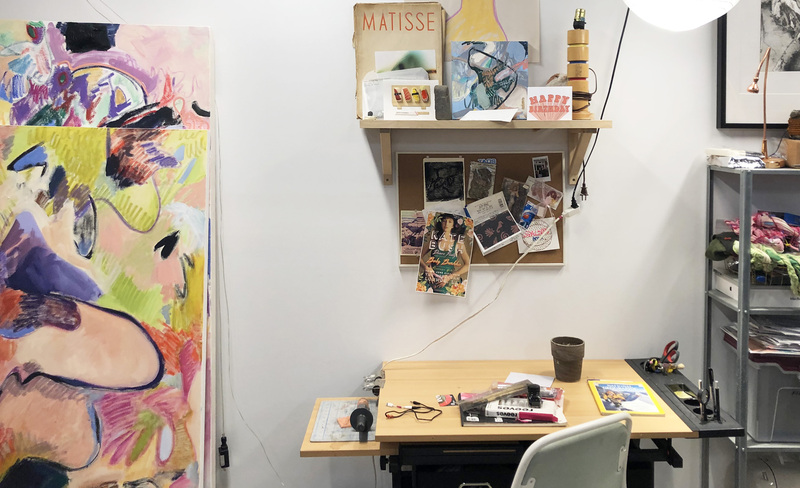 This workstation is directly parallel to the artist’s bed. Our last destination was at Amber Goldhammer’s studio, nestled nearby in the downtown area. Amber’s work can be readily spotted throughout LA, her signature “I Love You” graffiti serving as a backdrop for countless selfies. 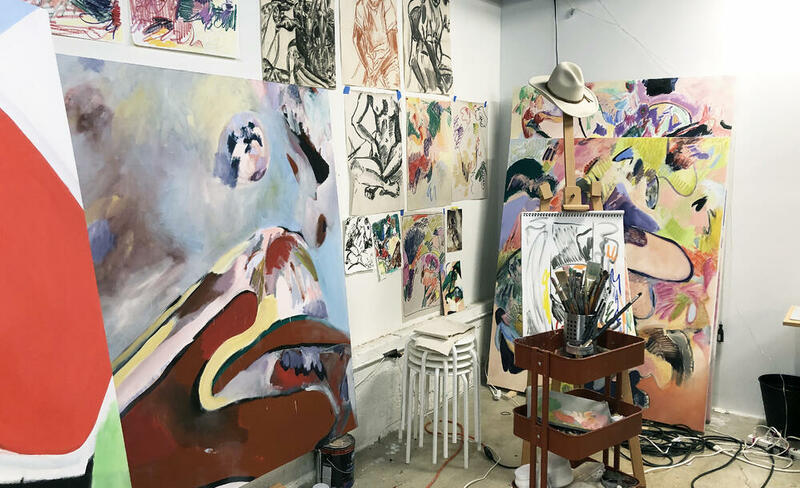 Amber has much more to offer than only murals though; in her studio, we saw acrylic sculptures, painted surfboards, hand-bent neon, and more, all under the umbrella of her trademark style. The artist, clad in custom leggings sporting her I Love You graffiti, walked us through her evolution from abstract expressionism to text-based art. Amber’s work is positive and fun, but there may be more behind her messaging than you think. She explained to the group that, especially as a woman, looking into the mirror and saying, “I love you” is extremely difficult and invaluable. This mindset also carries through to Amber’s relationship as a graffiti artist, a medium most often embraced by male artists. Through her work, Amber hopes to spread the ideals of self-love, no matter what you love to do and whether or not it falls within your expected norms. LEFT: Two of our favorite pieces from Amber’s studio collection, showing her ability to work with both bright and muted color palettes; RIGHT: An experimental tabletop sculpture spelling “I Love You” in shiny gold acrylic. Are you an interior designer or artist who wants to connect with local artists? Drop us a line, and we’d be happy to host you. More recommended reads this way..